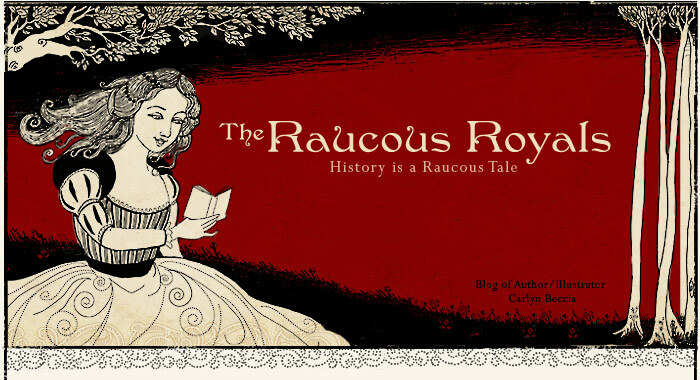 The Raucous Royals has been kind of hard on Christopher Columbus, so it may come as a surprise that I would recommend Christopher Columbus by one of my favorite authors Marion Day Bauer. I do have a soft spot for Columbus and this book hits it hard. Christopher Columbus tells the story of Columbus as the “dreamer” who had the courage to brave the unknown and the temerity to never give up on his goals. 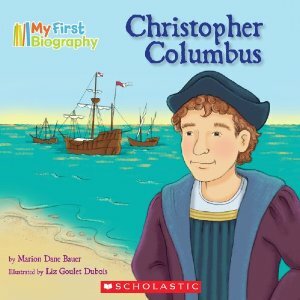 Liz Goulet Dubois’s charming boy-like depictions of Columbus pull at my childhood memories and remind me how much I loved this story as a kid. 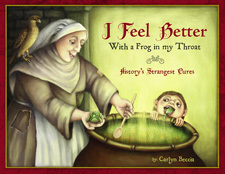 When I read my daughter this book, she most liked that Columbus kept asking Isabella and Ferdinand until he got his yes - a concept every child can relate to. Her favorite spread was when Columbus discovered “tierra” (land) with seagulls flying above his head. This book definitely has the “drool factor”. In the end, I want my daughter to love history and Christopher Columbus is the perfect first love. Sure, he will break her heart when she finds out her first love was most likely a syphilitic, marauding thug, but for now…. I am going to let her drool over Chris. Love it! I can completely relate: I want my daughter to be the typical girl dreaming of the perfect life as the beautiful princess in the tall tower with her savior knight. Then when she's a little older, I'll knock her down a few pegs with reality. I remember being sorely disappointed when I learned George Washington could and did tell a lie... ah well. Even as a kid, I was suspect of Chris. All his whining and begging to go on his big adventure reminded me of my spoiled cousins whining and begging to go to the mall: it wasn't for anyone else's benefit, just their own. Then I found out the truth about good old Columbus from my 7th grade history teacher and had the most profound "A-HA!!" moment of my junior high life. Best line of the day: "...he will break her heart when she finds out her first love was most likely a syphilitic, marauding thug..." LOVE it! The story here in Spain, is that Isabella and Ferdinand said yes to Columbus in the ducal palace of Medinaceli, in the province of Soria. Having lived there myself I totally believe it. 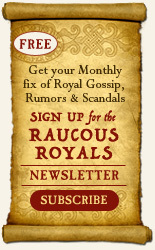 Elizabeth - I know what you are saying. I kind of want it both ways. I love that she enjoyed this book but when she gets older...she does need to learn the other side of the story. Rosie - oh I would love to visit the Medinaceli. It must have been so glamorous living there. Ha, ha...glamorous...oh not at all. Lots of tractors and a lovely village, tons of roman and medieval shards in the pine trees but minus five in the winter. They have restored the palace now though. Population of 200 when I lived there. Great memories. Well, I know who to contact now for traveling tips. I have never been to Spain. I amTRYING to learn Spanish right now from listening to those free podcasts and it just isn't clicking. But last night my 3 year old woke up from a bad dream and start screaming "ayudeme" and I actually understood her for a change. baby steps. Your three year old speaks Spanish? well, sort of. just what she learns in preschool. But lately it has been more and more. Kids are kind of weird like that. They pick up language much faster than adults. Thanks for this post, Carlyn! I think you hit the nail on the head here- this book (and others in the series) are real "first looks" for preschoolers. Soon enough they learn the unsavory details of history in school, but hopefully when that time comes, they will already be able to say- "Christopher Columbus! Yeah- I know stuff about him!" and take it from there. I have had a lot of teachers tell me they were happy to find an intro like this for the youngest age bracket. Yay, history!! exactly. I am just happy that teachers can squeeze in any world history and Columbus is a good place to start.